Sometimes, us simple worldwide collectors get lucky. We all hope to find that big dollar stamp variety lurking in a lot of off paper stamps, and every once in a while, we get a little taste. Not a million dollars worth of course – But in this case, I suppose about $100. #973iii – “Orange Background (10 known)- $750. “Repellex error, part of colour missing on part of one column of 10 stamps. 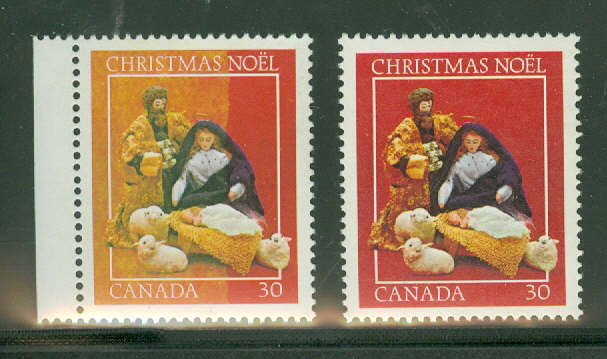 Four sheets are also known with similar repellex error causing 40-80% of the background of all right margin stamps to be orange rather than bright red. Values range from $100 – $350 depending on the percentage of orange background. Unitrade only lists values for mint stamps featuring this error, as, according to their information, only a few mint sheets experienced this problem. In my case I have something a bit different. 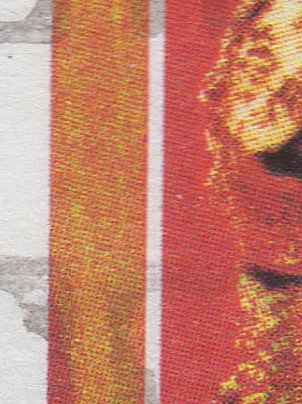 Definitely a repellex error – BUT – mine is a small stripe of off-color, and my stamp has been used. We had a short discussion over at StampBoards on this issue. So- Valuing mine is a challenge, but for my catalog purposes, I will go with the low end of Catalog value of $100. Having this on a cover would be nice, but seeing a used copy of this EFO is pretty neat as well. So – Worldwide collectors – keep hunting – And get specialized catalogs! Side Note: Googled “Repellex” trying to find this product, but seems like it does not exist anymore – But there is a Deer Repellent called “Repellex”.